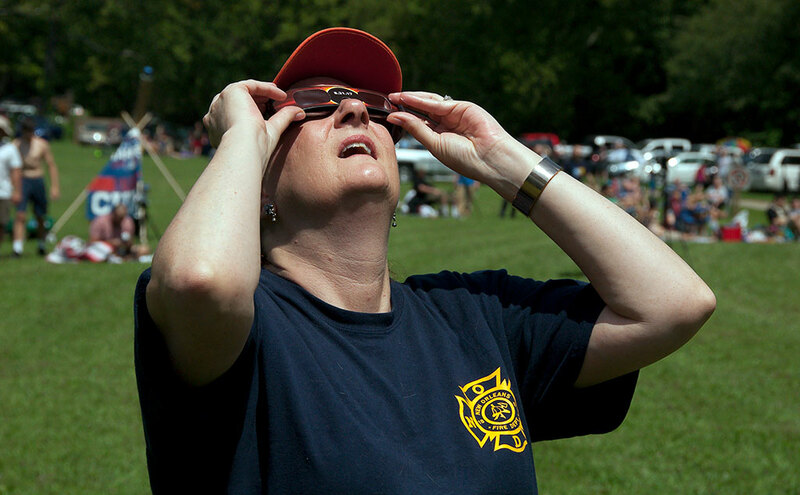 The Great American Eclipse of August 21, 2017 is visible in this view from St. Francois State Park, Missouri. 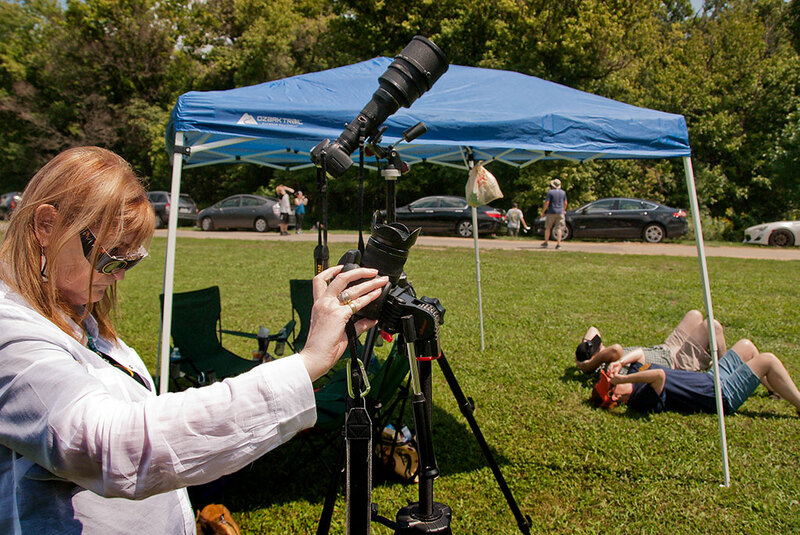 In 2012, I challenged all interested parties to Assignment: Team Blackout, to join my wife Abby and me on a journey to photograph the August 21, 2017 total solar eclipse at or near my mother’s hometown of Flat River (changed to Park Hills in 1994), Missouri. 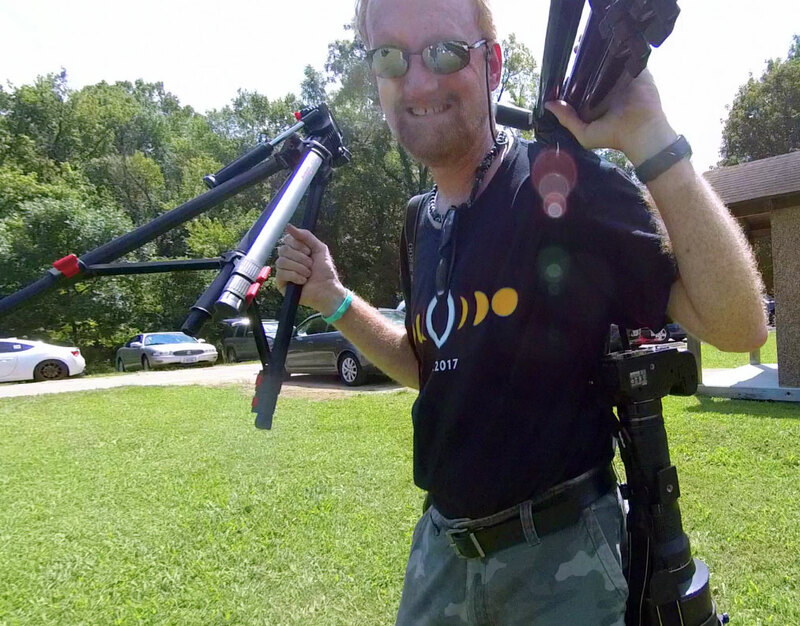 With commemorative t-shirt on, your host gathers his gear to photograph the solar eclipse. 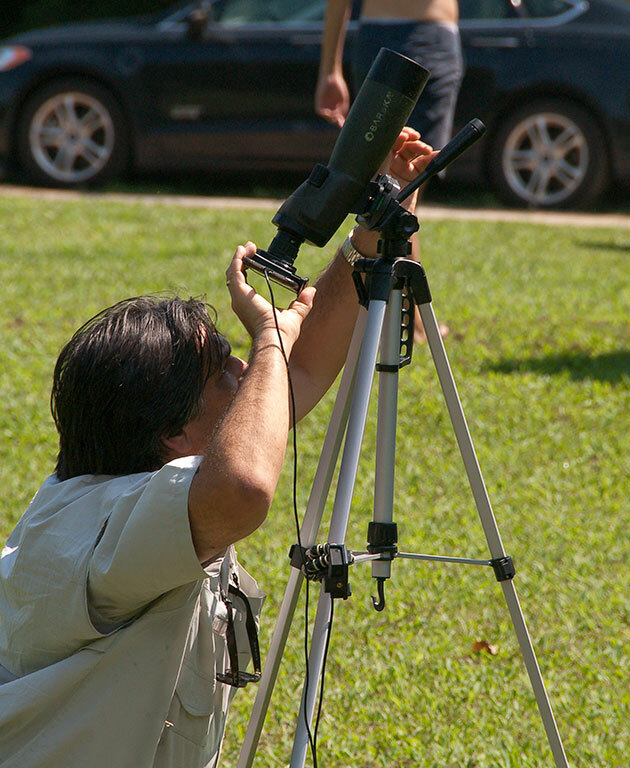 A man uses a telescope linked to his smart phone to view the solar eclipse. As the date approached, my sister Nicole and her husband Tracey planned to join us on the first leg of their two week vacation. We decided to try to be in nearby St. Francois State Park, just a few miles north of Park Hills. As the media hype grew, I started to feel serious misgivings about this mission, as did Nicole. We both imagined hurricane-evacuation-like 11-hour traffic stacks, sleeping in our vehicles by the side of the road and missing the eclipse as we sat motionless on the Interstate. 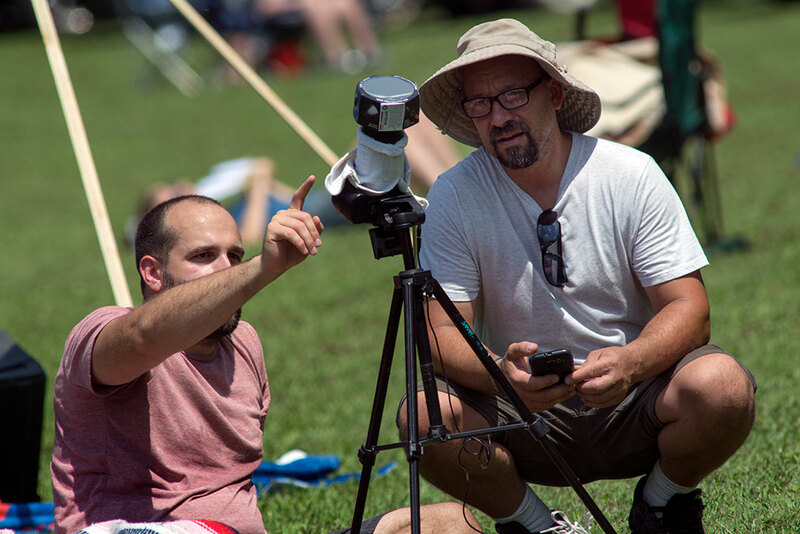 Eclipse viewers compare observations as the totality approaches. 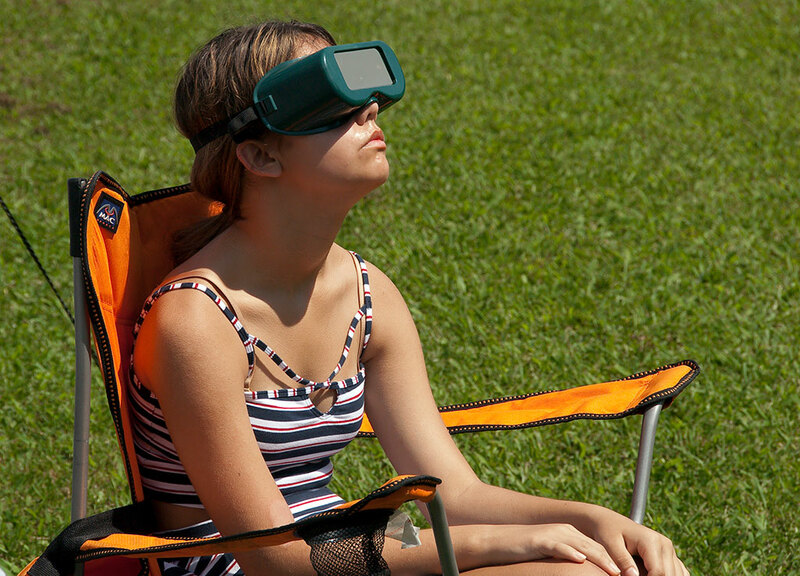 A young eclipse viewer uses a modified welder’s mask to view the crescent sun. Abby and I asked a co-worker to care for our Irish Wolfhound puppy Hawken, and set off very early Sunday morning, the day before the eclipse, for Rolla, Missouri, with our Chihuahuas, Sierra and Max, the official mascots of Team Blackout, in the back seat. Our plan was to get up early Monday and drive the remaining 90 minutes to find a way into the path of totality, hopefully meeting Nicole and Tracey. 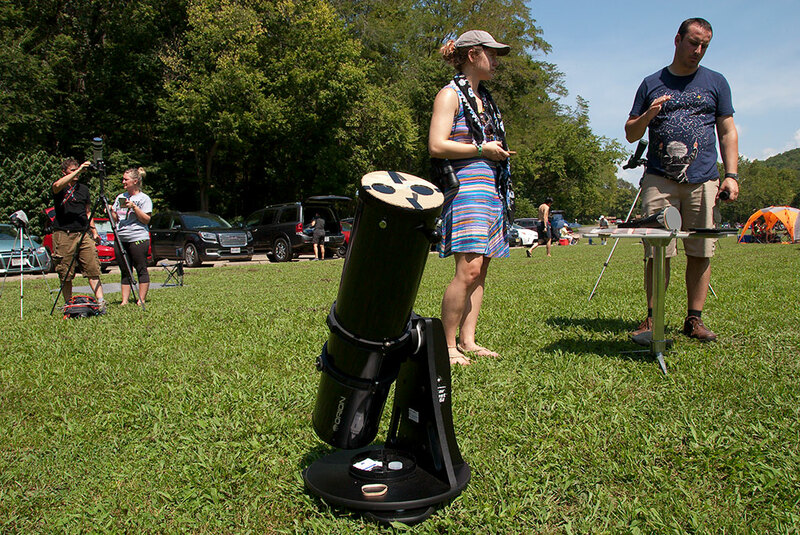 Eclipse watchers set up their telescopes and viewing devices. 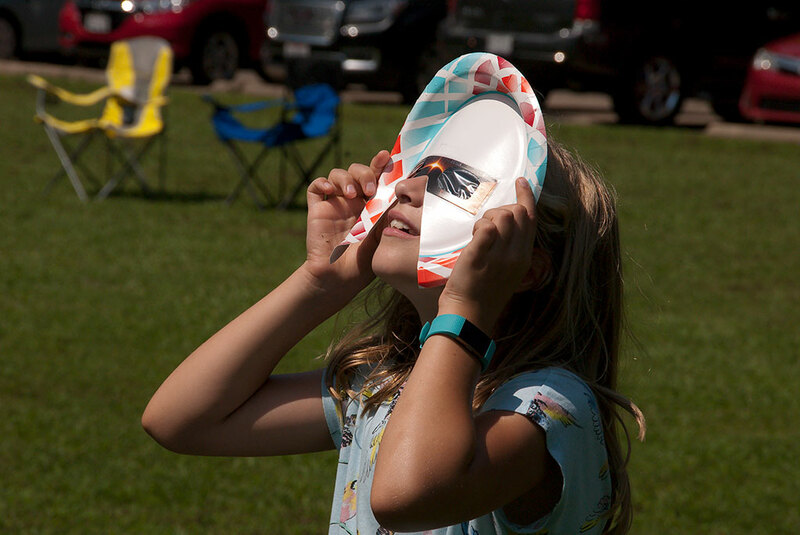 A young girl looks at the sun with eclipse glasses added to a paper plate for extra protection from the sun. On Sunday morning, we got on the road early. I-44 seemed normal, as did State 8 which led us to Park Hills. 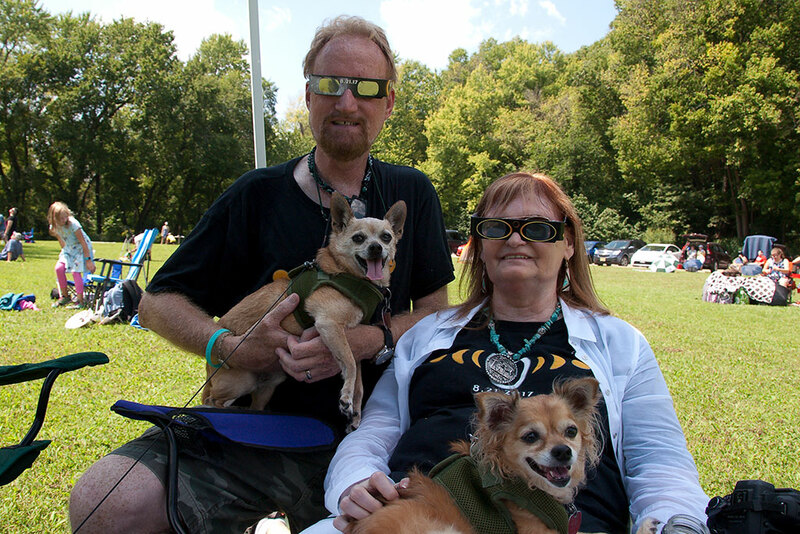 Abby and I pose with our eclipse glasses on and the Chihuahuas in our laps. We make up half of Team Blackout, and the dogs are our mascots. 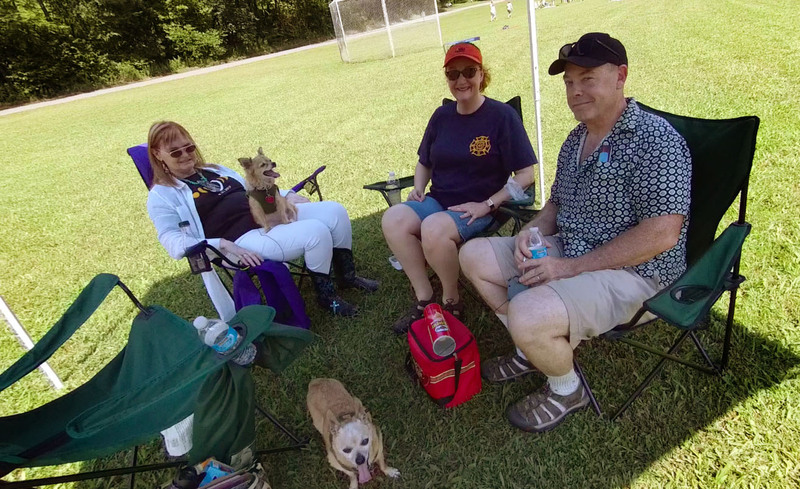 Team Blackout and their mascots hang out under my shade tent in St. Francois State Park. 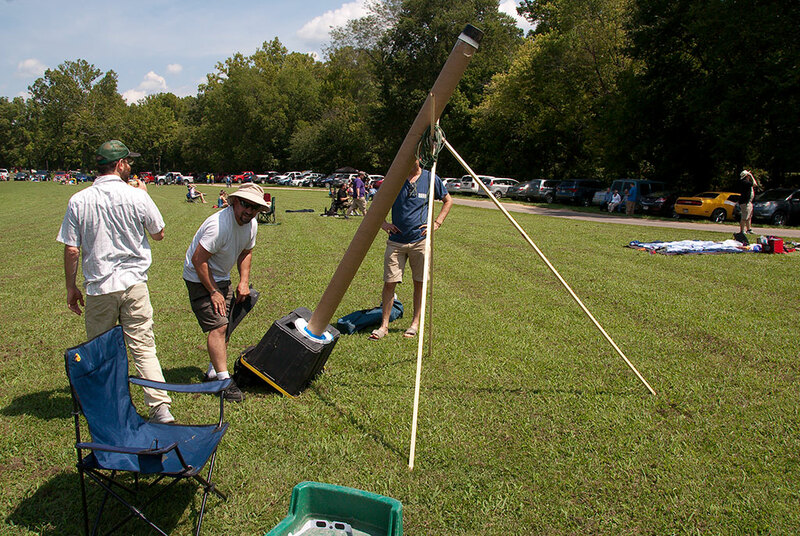 Amateur astronomers from Chicago set up a pinhole solar observatory made from a discarded carpet roll core. The viewing hood is a plastic storage bin. Tracey and I set up a 10×10 foot shade tent I bought at Wal Mart, and it made a huge difference as we waited for the event. The weather was excellent. It was warm with a nice breeze, and mostly clear. 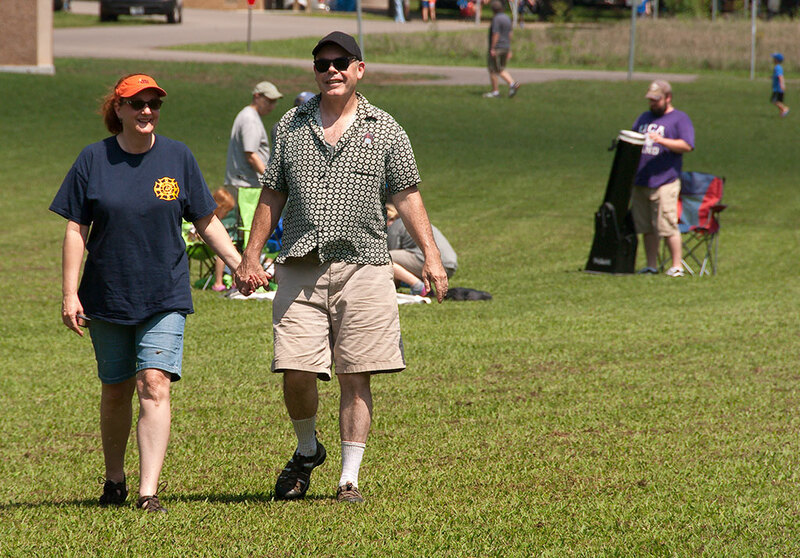 We weren’t alone in the park, but it certainly wasn’t crowded, and there was plenty of room to watch and work in the football-field-sized freshly-mowed clearing. Nicole and Tracey have a stroll as we await the totality. We saw a number of astronomical telescopes like the one in the background. 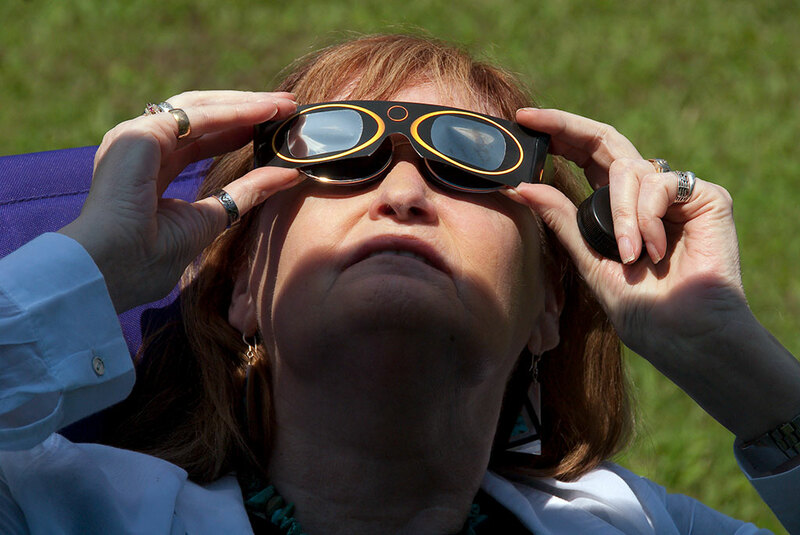 Nicole uses her eclipse glasses to watch as the crescent sun becomes a sliver. Less than a minute before the totality, a stray cloud covered the sun in our location, but drifted out of the way with just a few seconds to spare. 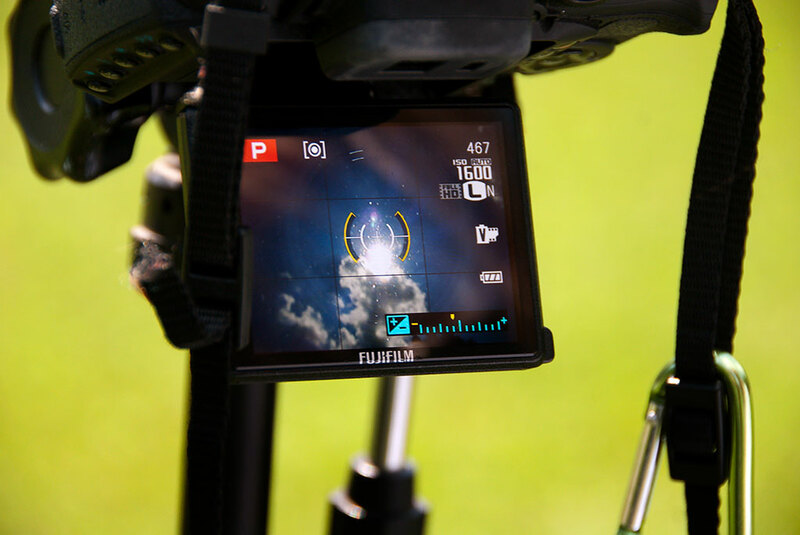 Abby’s camera shows the cloud that drifted out of the way just a few seconds before totality. Abby uses her eclipse glasses to watch the crescent sun as the totality approaches. I was not particularly interested in photographing the crescent sun. I find such photos unremarkable, and I could have made plenty of those without driving to Missouri. By the time the sun was 95% obscured, it was perceptibly darker around us, the shadows were sharper, and the color of the light was less saturated. Abby readies her camera just seconds before the totality, while Nicole and Tracey lay on the grass with their eclipse glasses on. You can see my 400mm plus teleconverter at the ready. The onset of the totality was quite abrupt, meaning the shadow of the moon was quite sharp. 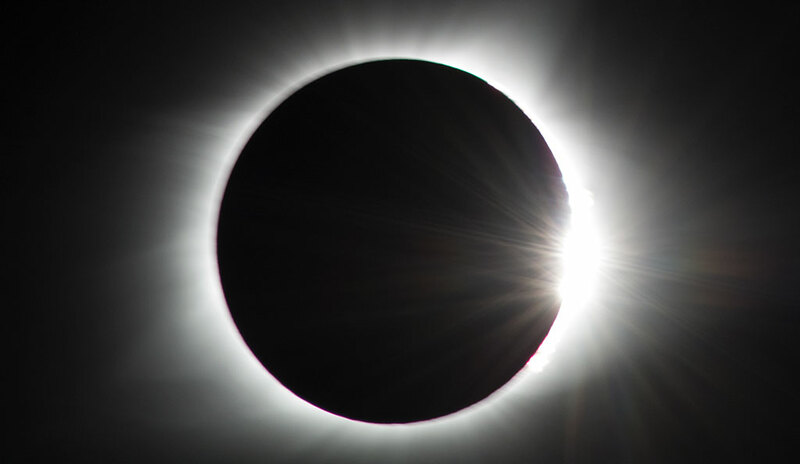 Some locations (Madras, Oregon for example), reported a longish appearance of the “diamond ring” effect, but we were quite close to the peak of the eclipse, and only saw the diamond ring for a few seconds. 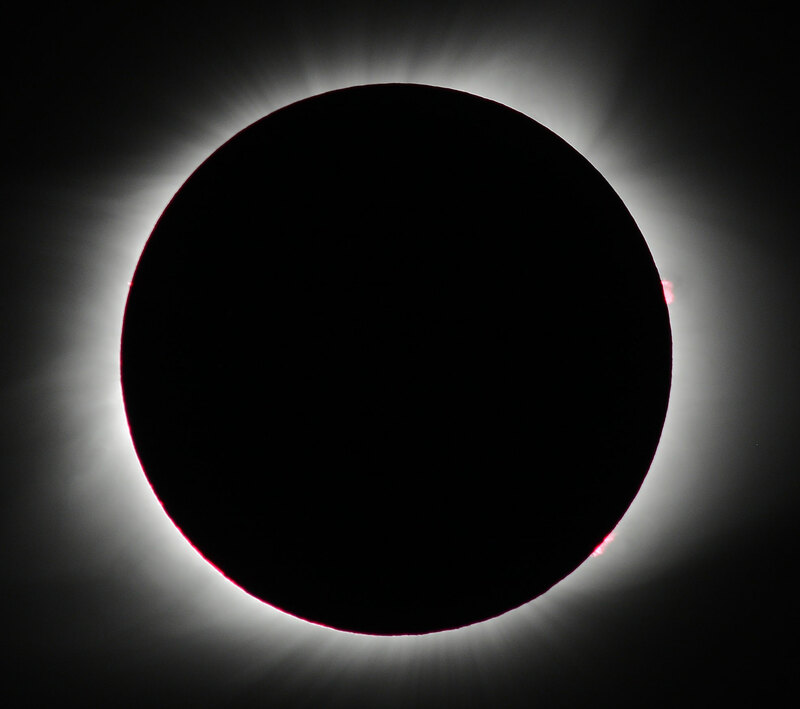 At our location, the “diamond ring” effect only lasted a second or two before the brightness was off-scale high. I was only able to make five frames of it. I understand how pre-science civilizations might regard this as a portend or omen: it was different than any astronomical or meteorological phenomenon I have ever experienced. The biggest reason for me to see this eclipse was a sense of obligation as a professional photographer. As my friend Wil C. Fry explained, “One of my reasons for not really trying to photograph this was: ‘Richard’s got this.’ So glad I was right.” Another person, a student, said, “I heard you should just enjoy the eclipse and buy a photo afterwards,” to which I responded that I should be one of the people selling the photo. To fill the frame with the moon in front of the sun surrounded by the solar corona, I chose my 30-year-old Nikkor 400mm f/3.5 with its well-matched teleconverter, the TC-14, for a focal length of 560mm at f/4.5 maximum aperture. Since I had never seen or photographed an eclipse before, I knew I would be guessing at the exposure. My first guess, f/8 at 1/160th at ISO 200 was a little dark. 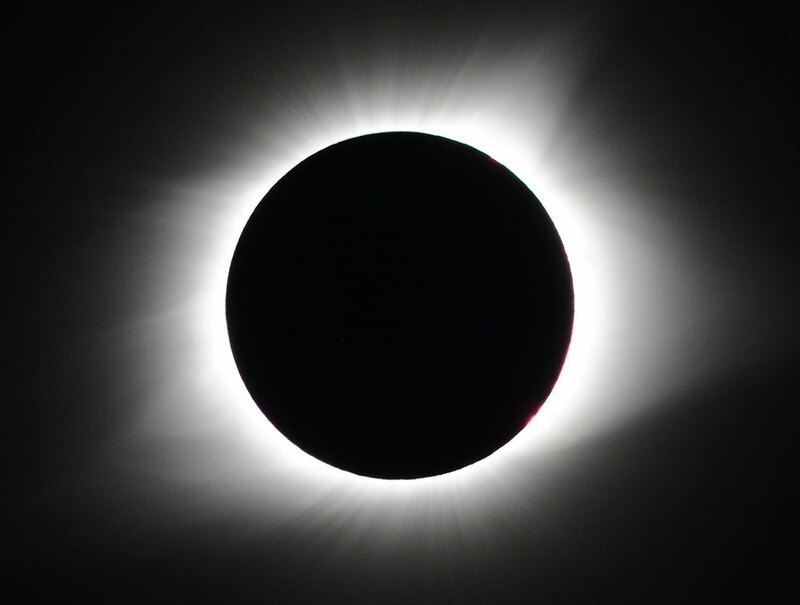 My first image of the totality was at f/8, 1/160th, ISO 200. 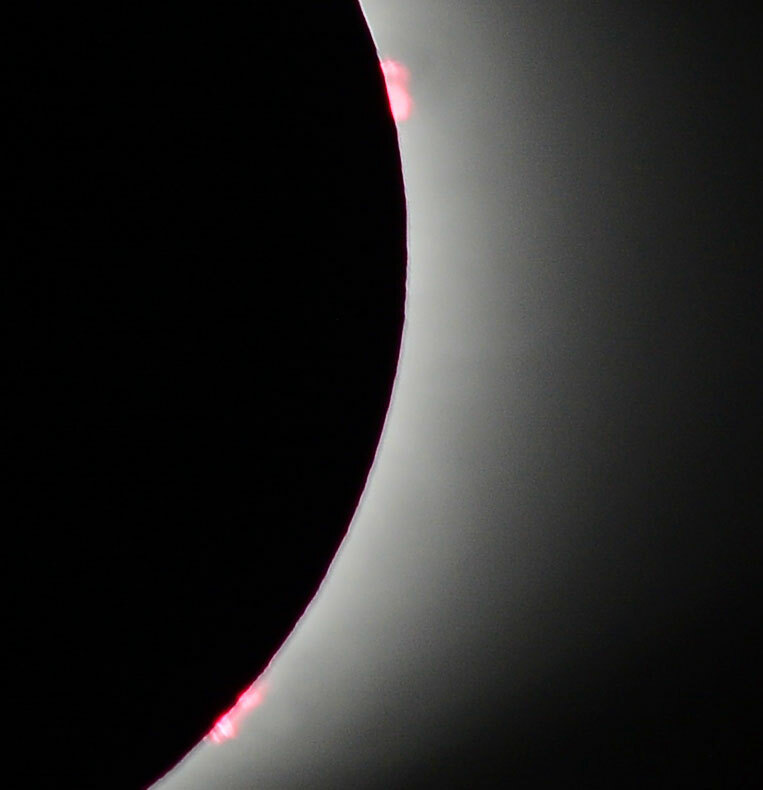 This is a tight crop on one of my first images of the totality. I quickly adjusted to create a brighter impression of the solar corona, visible only during total eclipses. The corona is an aura of plasma streaming out from the sun. For my main photos of this phenomenon, I shot at f/8, 1/80th, ISO 640. The drive home involved more traffic than the previous day, but only added about an hour to the trip. Abby and I decided we were very glad we took the time and effort to make the trip. The Great American Eclipse of 2017 was a success. 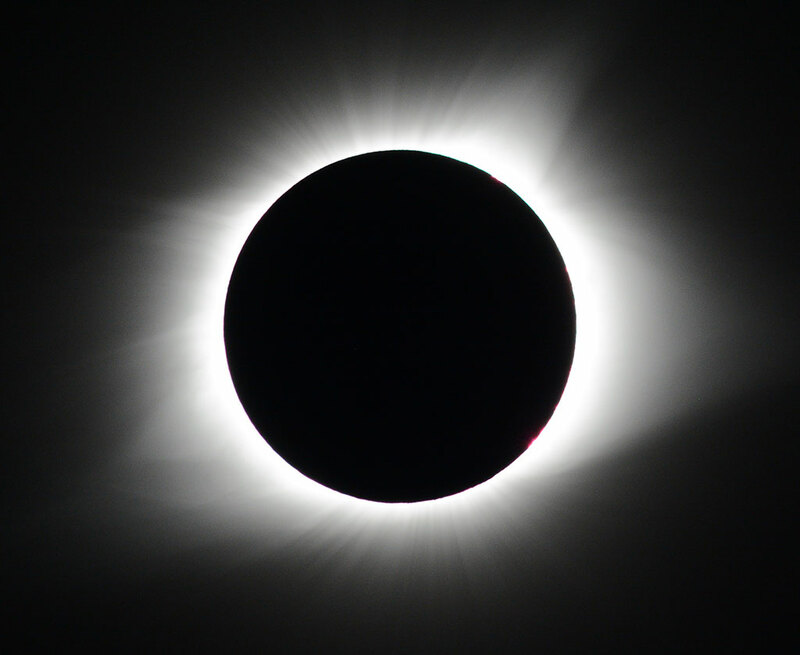 This view of the solar corona and was made at just about the peak of the totality, at f/8, 1/60th, ISO 640.